What a fun week for the Risk Number! We were honored in a few ways at the 2018 Benzinga Global Fintech Awards. Congratulations to our fellow finalists AdvisorBid, Brinker Capital, BrokerHunter, Envestnet, InvestCloud, Laserfiche, Minna, MyVest, OpenInvest, Orion, RBC, Redtail, Sharesight, Vestwell and more who were recognized. We love serving advisors alongside some of the industry's best fintech and we're fortunate to be honored with you. We won Best Advisor Platform! What an incredible testament to the fearless investing movement advisors are building. When advisors aren't afraid to talk about risk, investors aren't afraid to make the right decisions. The Best Advisor Platform isn't the only award we took away at Benzinga's events this week. This next award is for the incredible advisors we get to serve every day. Our friends at LikeFolio comb through Twitter data to assess trends and consumer sentiment, and they found a trend that we're pretty happy about. With a strong rise in Riskalyze chatter, and almost all of it positive, we'd like to say something back to our customers: the feeling is mutual! 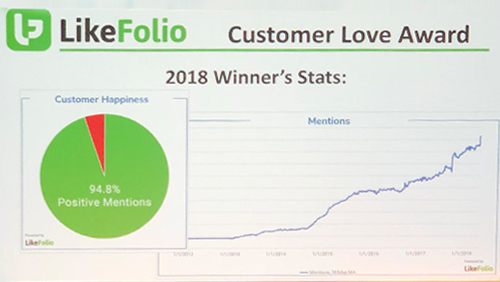 Full disclosure: LikeFolio's founder is a Riskalyze board member, but the numbers don't lie—our customers are the absolute best! 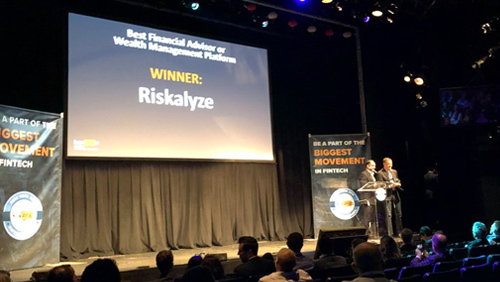 Aaron Klein, CEO at Riskalyze, took the stage to share about the movement we're building with advisors. Check out the recap below. What a week so far! Thanks Benzinga, thanks to our wonderful partners at the event, and most of all, thanks to the advisors who empower the world to invest fearlessly.